This is where I and most motorcyclist would say, “Yes, …” and list many everyday endeavors that are just as or more dangerous. I have firsthand knowledge that motorcycling is dangerous. 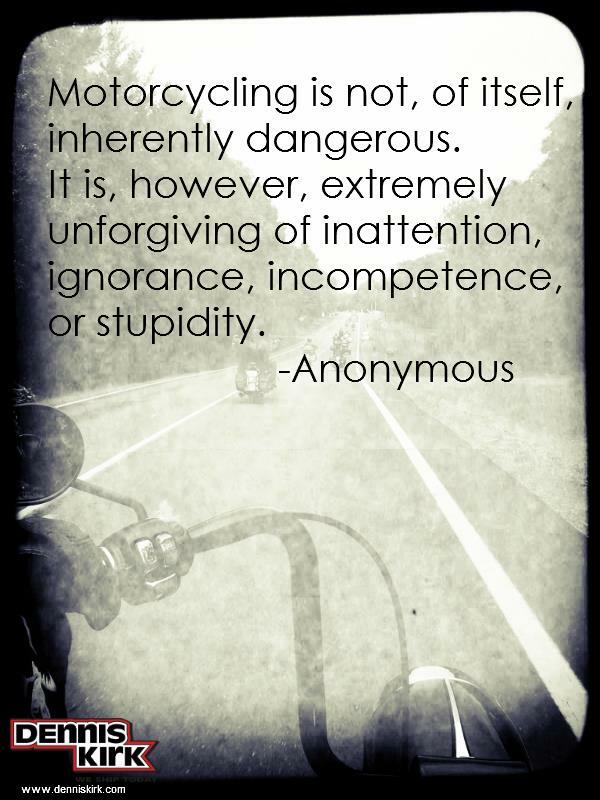 Anyone who rides and doesn’t think so is asking for trouble and not taking safety seriously. If you are hit by something or you hit something you will most likely get hurt and if either of you are moving very fast you will get hurt badly and most likely end up in a hospital. Been there done that (April 2008). I almost stopped riding after a day and a half stay in the hospital. No broken bones just internal bleeding and I hurt like heck and was sore for many weeks. Moments after crashing I was sure I had broken ribs and who knows what else and yes my life did flash before my eyes… Been there done that before too. “Can this be the way it all ends“, I ask myself. I did think long and hard about riding again. I just wasn’t sure if I wanted to do it anymore. My buddies encouraged me and I did miss riding but even after I healed physically I just wasn’t too sure. One of my concerns was my wife Janet. Even if I were to ride again I didn’t want her to worry when I was out riding alone and what if Janet had been on the bike when I had the accident? I don’t know what I would have done if she had been hurt or worse… So I struggled and I think Janet knew I was struggling about my decision. Then one day Janet said to me, “Ivan if you want to ride again, it’s OK with me and I will ride with you!”. Have I told y’all how wonderful a wife Janet is… Well, that should have told you right there. So having Janet’s blessing did help but I still had to work through all the issues. Time does heal physically and mentally and I cautiously resumed my riding. After the accident I continually went over and over and over in my mind how this happened to me. There were so many “what ifs“… any one of them could have prevented my crash. I had ridden down to visit my parents and brother 200 miles from home. The night before I was to return home I did not sleep much at all, did not leave for home until later in the day, had the sun in my eyes, I was really fatigued, I panicked and hit the brake too hard and tried to steer around the car but… Anyway it happened and it hurt badly physically and mentally. Because of all that has happened I have re-evaluated everything, I did and thought, about riding. Now I really know what can happen to you when you do crash. I am ever mindful of my physical and mental being and others riding with me. I try to stay rested and not over do it. I make a special effort to stay hydrated. Make sure I am aware of everything in my surroundings. Statically I know that the more vehicles there are around you the more likely you are to not be seen or just be in the wrong place at the wrong time. When my ride requires traveling through large unfamiliar cities I try to avoid rush hour traffic or travel around it. Of course that is not always possible and I am extra careful when I do. I enjoyed riding the remote areas before my accident and I do even more now. I can handle the bike and roads but those pesky cars, trucks or whatever… that I’m not too crazy about. Is anyone wondering what became of the bike I wrecked? My 2000 Kawasaki Vulcan Nomad was “totaled” by the insurance company and this a year (April 2007) after customizing the Nomad to my liking. Most all the damage was cosmetic but to have a bike shop replace all the parts and with the labor the total amount was greater than what the bike was worth. I put a pencil to the cost of the parts and realized I could buy the bike from the insurance company and fix it with what I got back from the insurance company. So the old Nomad was back on the road and we have taken many long trips on it afterward. In October 2009 I bought a new 2008 Goldwing with ABS brakes. One of the big selling points of my decision to buy the Goldwing was the ABS brakes. No more braking too hard and causing a skid. After the crash, ABS brakes was ever on my mind and was the driving force behind me getting a new bike. It is amazing the difference ABS makes when stopping quickly. I can’t say enough about the control… If only I had ABS when I crashed… maybe the accident wouldn’t have happen or maybe it would have… anyway… God only knows but I’m sure it would have helped… those seconds trying to recover from an uncontrolled skid would have been used to avoid that car… Janet has even noticed and comment how much better I handle the Wing over the Nomad and that makes her even more at ease while riding… Oh, did I mention how lucky I am to have Janet as my wife! This entry was posted in Riding Tips and tagged Abs, ABS Brakes, accident, blessing, brakes, broken bones, cars, dangerous, encouraged, fatigued, Goldwing, healing, hospital, hurt, internal bleeding, mental skid, Motorcycle, motorcycle ride, Motorcycle Touring, motorcycle travel, motorcycle trip, Motorcycles, motorcycling, physical, rested, safety, sun, trucks, unfamiliar cities, what ifs, wife, wing. Bookmark the permalink. Great post Ivan, glad to hear you both got back on the bike. We are both lucky men, my wife is also a keen pillion and very supportive of my love for two wheels. Thanks for the post on my blog, its only new but looking at your blog inspires me. Hope to share some more stories soon. Hi TR, how’s the new Goldwing? Hope you are enjoying it and ride safe! Having that moment when it all goes sideways is almost essential, I think. It teaches a different way of thinking, lets us know what we’re really going to do when the chips are down. A lot of folks take the sensible option and go back to four wheels after that moment, but people are unique in having the gifts of learning and passion, and the best those of us with the passion can hope for is to come back stronger. Having that moment also teaches respect for the bike and the reality of riding…and also some humility as a rider. It CAN happen to you, you are NOT the perfect rider of all time, and you can (and better) still learn what your bike teaches. I would worry, though, if the emotion learned is fear; respect and acceptance of the realilty of riding might be better. I had an accident w/ Bambi that left me in the hospital for 11 days and broke all the ribs on the left side of my body. I too struggle with riding and fear. It has made me VERY cautious and to slow down on the speed. (used to ride avg. of 70 mph on highways, now 55-60 mph) It’s nice to know I’m not the only one to have doubts. Am planning a ride to Canada, and the idea of NOT going will overcome my fear. A great article. Thanks!